POST a QUESTION or READ FAQs about how to install and wire electrical outlets or receptacles in buildings. How to wire an electrical receptacle ("outlet" or "wall plug") when there are just two wires (hot and neutral) but no ground wire. This article explains that when there is no safe grounding conductor or "ground wire" at an electrical receptacle location you need to choose the proper receptacle type and make the proper wire connections for safety. This article series describes how to choose, locate, and wire an electrical receptacle in a home. Electrical receptacles (also called electrical outlets or "plugs" or "sockets") are simple devices that are easy to install, but there are details to get right if you want to be safe. Here we discuss how to select & wire a two-wire ungrounded electrical receptacle when the electrical circuit has no grounding conductor. We describe how to add a grounding conductor on older two-wire circuits that lacked an original grounding conductor, citing pertinent sections of the U.S. National Electrical code such as NEC Article 250.130 Equipment Grounding Conductor Connections. We discuss how electricians address un-grounded receptacles or circuits by other approaches such as replacing the receptacle with a GFCI type receptacle or "wall plug". In Carson Dunlop Associates' sketch at left the wire circuits shown at upper right and lower right are both two-wire electrical circuits where no ground wire is present. At right in the photo is the type of electrical receptacle to use on two-wire (no ground) circuits. If no ground wire or ground path is provided, it is improper and unsafe to install a grounding (3-prong) electrical receptacle on that circuit. Watch out: as you see in the two illustrations at the left of our sketch, a circuit with a ground wire will present a bare or green-insulated wire and there will be three wires (or more) present. The flexible metallic conduit exterior of BX cable, for example, is not a safe, usable pathway for electrical grounding. We use the proper term electrical receptacle to describe the "wall plug" or "wall outlet" into which you will insert a two-prong or three prong plug to connect an appliance, lamp, etc. Technically in the electrical code, an "outlet" is any place in where you provide a junction box and electrical wires to which something can be connected: a light fixture or an electrical receptacle, for example. Before doing any work on the switch, the power source must be turned off by setting a circuit breaker to OFF or removing a fuse. 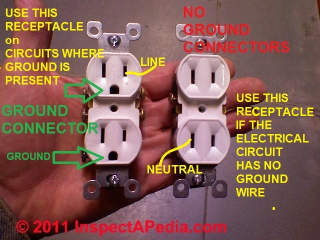 Our photo shows a conventional grounded three-prong electrical receptacle - the round hole is the ground connection - at the left end of the picture closest to my thumb. At right in the photo is an ungrounded electrical receptacle. This is the right device to install if no ground is present on the electrical circuit. You don't want to "fool" a building occupant into thinking that a ground is present when there is not one, so you don't install a receptacle that has that third ground opening in its face. Some older two-wire circuits which are covered with a flexible metal jacket ("BX" or "armored cable" wire) may provide a ground path by means of the cable jacket itself. We don't rely on it, and in event of certain short circuits it's unsafe: the exposed metal sheathing of the wire becomes live, risking a shock. So where do the wires go: to which screws on the electrical receptacle (shown just above) do we connect the black wire, white wire when there is no ground wire? The white "neutral" wire - this wire is connected to the silver screw on the electrical receptacle, often labeled "neutral" . You can see our white neutral wire connected to a silver screw on the receptacle in our photo, below-left. The black "hot" wire - this wire is fed from the circuit breaker to deliver power to the receptacle, and it connects to the brass or bronze-colored screw on the receptacle, often labeled "hot" or "live". You will see the hot black wire connected to the bronze or darker-colored screw on the receptacle shown at below right. The receptacle we used for these photos happens to be a 20-A rated device that permits the wire to be inserted straight into a clamp that is tightened against the wire by the screw. Also see BACKWIRED ELECTRICAL RECEPTACLES. The missing ground wire - since a two wire circuit has no ground wire, you should have chosen an electrical receptacle that does not include an opening for the ground prong on a wall plug. So the receptacle will also have no ground screw. if you had a ground wire you'd use a grounding receptacle and the ground wire connects to the green ground screw usually found on the bottom of the electrical receptacle (photo at left). You can also see our ground wire connected at the left side of our previous photo, above-left. The illustration at left shows the typical wiring of an electrical outlet or "receptacle", courtesy of Carson Dunlop Associates. But the typical wiring instructions for receptacles include a ground wire that may not be present on your circuit - as we explained just above. Keep in mind that while a two-wire circuit may be permitted and "legal" in some jurisdictions it is not as safe as an electrical circuit (and receptacle) that has a grounding conductor. Let's at least not make the un-grounded and two-wire circuit / electrical outlet even more dangerous by installing the wrong receptacle type. Installing a receptacle that includes a third opening for the wall plug's ground connector is dangerous if the circuit is not really grounded. Such as "false ground" means a false sense of safety that is not present. Watch out: Electrical components in a building can easily cause an electrical shock, burn, or even death. Click any image to see an enlarged, detailed view of electrical wiring details for "plugs" or electrical receptacles. The electrical receptacle must be properly screwed to or mounted in the junction box, and the extra length connecting wires carefully pushed back into the junction box so as to avoid crimping, damage, etc. An electrical receptacle cover plate must be installed over the finished receptacle. We like plastic cover plates better than metal as they reduce the chances of a cover plate becoming electrically "live" and thus unsafe. Do not extend or add circuits, wires, or devices to an existing two-wire knob and tube electrical circuit. Watch out: while it is "legal" to add an electrical receptacle to an existing 2-wire circuit such as that shown at top right in our sketch above, it is not permitted to extend a knob-and-tube circuit (bottom right in the sketch) to add additional receptacles (or anything else) in most jurisdictions. You can replace an existing damaged 2-wire receptacle in either circuit type but you should not extend or add receptacles and wires to an existing knob and tube circuit. The hot and neutral wires must be connected to the proper terminals on the electrical receptacle. 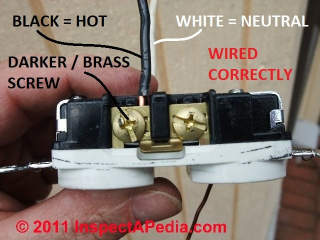 The "hot" or "live" black wire (or red wire) is connected to the brass-colored screw terminal on the electrical receptacle, and the "neutral" white wire is connected to the silver-colored screw terminal on the electrical receptacle. Carson Dunlop Associates' sketch points out that the white wire, i.e. the neutral wire, will be connected through the receptacle's internal parts to the wide slot on the receptacle face in order to assure that the neutral wire side of an appliance being plugged-in there is properly connected. 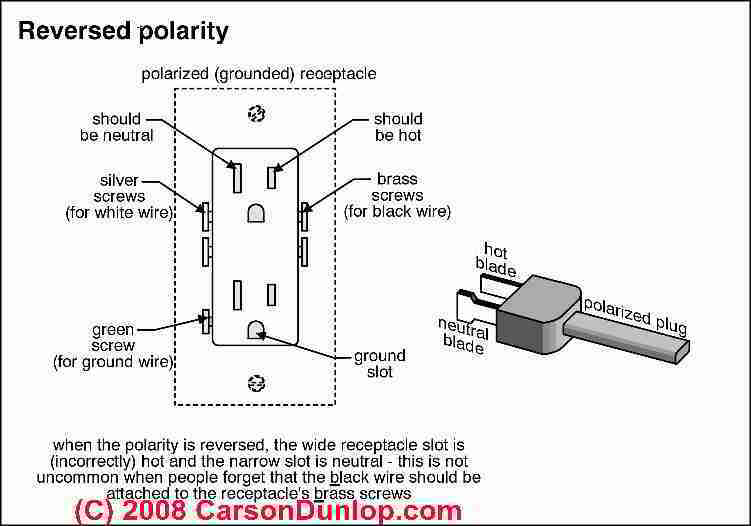 Watch out: Reversed polarity on an electrical outlet is dangerous. If you accidentally reverse these wires the device you plug in to the receptacle may "work" but it is unsafe and risks a short circuit, shock, or fire. Details are at REVERSED POLARITY ELECTRICAL DEVICES / CIRCUITS. 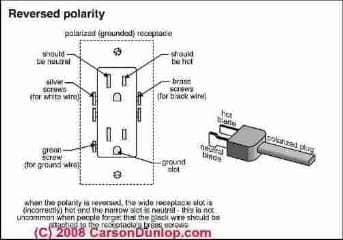 Some appliances and some electronic equipment may be damaged if left connected to a reversed-polarity electrical circuit. Do NOT connect circuit wires to the wrong terminals on the receptacle. Readers have proposed jumping the neutral to ground, for example. Don't do that - it's unsafe and illegal. Can I Install a GFCI or AFCI Receptacle on a 2-Wire Electrical Circuit? Generally, if installed on a 2-wire circuit that has no electrical ground conductor, a GFCI electrical receptacle will protect against a hot to neutral short or a hot to ground short at the receptacle but its internal test circuit cannot be used - that is, you can't easily test to know know that the receptacle is working. "GFCI Protected" and "No Equipment Ground." Because some devices can be damaged if older style cord plugs are reversed on an un-grounded circuit and because some devices may depend on electrical grounding for safety, n my OPINION a better approach would be to put a GFCI breaker in the panel serving the circuit and to use only 2-prong electrical outlets on a two-wire circuit. That adds GFCI protection while at the same time it prevents fooling people into thinking that the circuit has a ground. AFCI's are similar to GFCI's discussed above, but they include an additional level of protection against fire by detecting small electrical arcing at a connection - a condition that can lead to overheating and fire. As you can see from this US CPSC photo, you can add Arc fault protection to a home circuit by installing a special circuit breaker in the electrical panel. By this means you can provide arc fault protection and thus improved fire safety for all electrical outlets on the circuit - for example in the building's bedrooms. 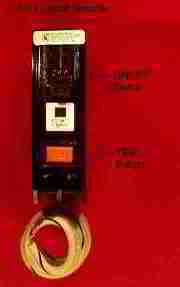 and AFCIs ARC FAULT CIRCUIT INTERRUPTERS for details about these devices. (3) Non–Grounding-Type Receptacles. Where attachment to an equipment grounding conductor does not exist in the receptacle enclosure, the installation shall comply with (D)(3)(a), (D)(3)(b), or (D)(3)(c). (a) A non–grounding-type receptacle(s) shall be permitted to be replaced with another non–grounding-type receptacle(s). (b) A non–grounding-type receptacle(s) shall be permitted to be replaced with a ground-fault circuit interrupter type of receptacle(s). connected from the ground-fault circuit interrupter-type receptacle to any outlet supplied from the ground-fault circuit-interrupter receptacle. (c) A non–grounding-type receptacle(s) shall be permitted to be replaced with a grounding-type receptacle(s) where supplied through a ground-fault circuit interrupter. Grounding-type receptacles supplied through the ground fault circuit interrupter shall be marked "GFCI Protected" and "No Equipment Ground." An equipment grounding conductor shall not be connected between the grounding type receptacles. When converting an old 2 prong outlet to a new 3 prong (grounded) outlet - is it legal to run a new single ground wire from the new outlet back to the breaker box ground bar? I.E. not replacing the existing BX wire. With that same thought - if there are multiple new 3 prong outlets - do they all need run all the way back to the breaker box ground bar? Or can the multiple outlets be branched off a main feeder wire back to the breaker box ground bar? Bottom line: Yes you can do what you describe. But there may be easier places to connect the new grounding conductor that I'll describe. Current U.S. National Electrical Code 250.130(C)(1) and 250.130(C)(4) permit you to run a new grounding conductor wire OR to connect to an existing circuit grounding conductor. A non-grounding type receptacle can be replaced with a grounding type receptacle if an equipment grounding conductor is installed and connected to any accessible point on the grounding electrode system. OPINON: to me this reads that you don't have to run a wire all the way back to the panel IF you have a properly-wired grounding electrode wiring system access point that's closer. An example would be a nearby 3-wire circuit that includes a properly sized, routed, and connected grounding conductor already installed. But Watch out: most electricians would just run a whole new wire (hot, neutral, ground) from the panel. I don't think that's just to gouge the client's wallet. It's because nobody who who appreciates the reasons for the NEC - avoiding fire, shock, death - wants to bet their home and savings on unknown work and unknown wiring conditions in an existing house where they didn't do the earlier work. You probably have also read of a different option: installing a GFCI receptacle; you can't test that the GFCI is really working - since its test button just tests an internal circuit - without grounding its hot and neutral to a real ground somewhere, but that's a legal alternative some electricians use. Watch out also: some electricians rely on using the external metal jacket of some BX wiring (that includes a "bonding strip" an internal flimsy wire that pretends to give continuity to the cable sheath) but that is in my view dangerous - the jacket is not intended as a conductor, its connections over the circuit depend on clips at each metal box that in turn depend on both a screw and a nut both of which may be loose, and I've seen people shocked by touching the jacket when a fault was also present. Here is the current, pertinent U.S. electrical code that discusses adding a grounding conductor on previously non-grounded receptacles or branch circuits. 250.130 Equipment Grounding Conductor Connections. Equipment grounding conductor connections at the source of separately derived systems shall be made in accordance with 250.30(A)(1). 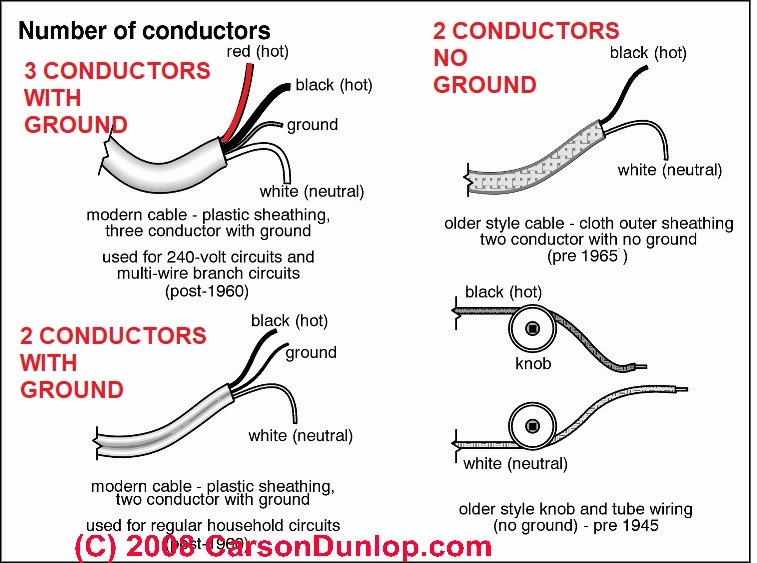 Equipment grounding conductor connections at service equipment shall be made as indicated in 250.130(A) or (B). For replacement of non–grounding-type receptacles with grounding-type receptacles and for branch-circuit extensions only in existing installations that do not have an equipment grounding conductor in the branch circuit, connections shall be permitted as indicated in 250.130(C). (5) For grounded systems, the grounded service conductor within the service equipment enclosure. Replace a nongrounding-type receptacle with a grounding-type if there is an equipment grounding conductor available and connect the grounding conductor. If there is no equipment grounding conductor then replace with a nongrounding-type receptacle or a GFCI type that is marked "No Equipment Ground," or a grounding type if it is protected by a GFCI and marked "GFCI Protected" and marked "No Equipment Ground. An equipment grounding conductor shall not be connected from the GFCI receptacle that does not have an equipment grounding conductor to any other outlet supplied by the GFCI receptacle, and an equipment grounding conductor shall not be connected between grounding-type receptacles that are protected by a GFCI type receptacle that has no equipment grounding conductor. - which is not what you want to do anyway. 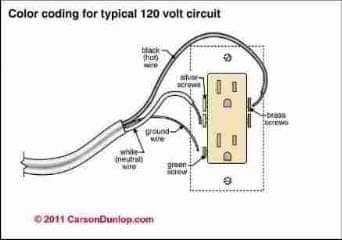 You want to add a grounded or "three-prong" electrical receptacle where an older un-grounded "two prong" receptacle was wired to a 2-wire circuit that has no grounding conductor. For a 15 or 20 ampere circuit code experts point out that in a retrofit to add a grounding conductor you are permitted to run a No. 12 copper that is bare or green or green with one or more yellow stripes by itself so as not to be subject to physical damage from the receptacle grounding terminal to the grounding electrode as described in 250-81 or, after the 1996 NEC is adopted, to any accessible point on the grounding electrode grounding conductor . US NEC 110-12 requires that electrical work be performed in a neat and workmanlike manner. That general remark means the on-site electrician decides where and how to run the wire, but it has to be protected from damage. And all of this presumes that once the ground is provided you are going to install a grounded-type electrical receptacle. Next I looked at Article 300 that describes running wires. 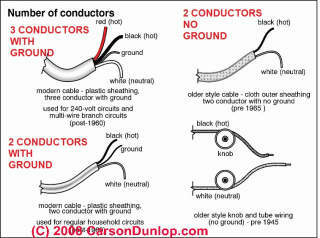 300.3 Conductors. (A) Conductors. Conductors must be installed within a Chapter 3 wiring method, such as a raceway, cable, or enclosure. This seems to say you cannot run an isolated grounding conductor wire outside of the enclosure of the hot and neutral wires. NEC 00.3.B (2) Grounding and Bonding Conductors. Equipment grounding conductors can be installed outside of a raceway or cable assembly for certain existing installations. See 250.130(C). Equipment grounding jumpers can be located outside of a flexible raceway if the bonding jumper is installed in accordance with 250.102(E). Section 250.130(C) allows a grounding-type receptacle to be used as a replacement, instead of a GFCI protected outlet, if the equipment grounding terminal of the receptacle is connected to an acceptable grounding means. In the 2011 NEC, the grounding terminal of a replacement receptacle used in a two wire system could be connected to the grounding electrode system, the grounding electrode conductor, or the equipment grounding terminal bar in the same enclosure where the branch circuit for the receptacle originates. A new option for connecting the grounding terminal of a replacement receptacle has been added in 2014. Now an equipment grounding conductor that is part of another branch circuit that originates in the same panelboard as the branch circuit for the receptacle can be used to provide a grounding means for the replacement receptacle. The new option is similar to the permission to connect the replacement receptacle grounding screw to the equipment grounding terminal bar in the enclosure where the branch circuit for the receptacle originates. However, it could be much easier to connect to an equipment grounding conductor from another branch circuit than to install a new equipment grounding conductor all the way back to the panelboard. I was reading your sections on grounding on older home as I am currently in the process of having several two-prong outlets upgraded. In my research, several people suggested it would be possible to ground to the box using a grounding screw. Thanks so much for the question - in the article above and elsewhere I have mentioned the problem of the missing ground wire on a two-wire circuit and also the problem of unreliable ground connections through the receptacle mounting strap screw - but your question helps me see that I must not have made the point clear and easy enough to find. I take it from your message that you already understand the danger of just placing a 3-prong receptacle into an ungrounded box, offering a "faux" ground that would be unsafe. In other words, if the circuit wiring into the junction boxes in which you ask about converting from 2-prong to 3-prong receptacles does not include a ground wire, do not install 3-prong outlets and DO NOT rely on just grounding the box to a new 3-prong receptacle's ground screw. 2. Neutral wire short: similarly unsafe but more subtle is a short between the neutral wire and ground anywhere in the circuit. In this case the circuit appears to continue to "work" properly, in that lights light or a device is powered when plugged-in; but the BX exterior sheathing will be carrying the return circuit all of the time that the circuit is in use - potentially shocking someone, and again unreliable as I explain in the next point. Working on an older home in which someone had done this I encountered exactly this situation - it's not just "theory". Turning off power to a circuit on which I was working, I tested to see that the hot wire was "dead" before touching anything. My helper, working in the same room, plugged in our shop vac to begin some cleanup, connecting the shop vac to a nearby receptacle that had a different hot wire entering it. The box and BX cable I was working on became "live" (and shocking) when she turned on the vacuum cleaner! The BX cables from several circuits had some metal contact points in common and the neutral circuit was flowing through the BX not through the proper neutral wire (or part of the current was thus flowing). 3. Even if you didn't care about shocking someone or starting a fire, the "apparent ground" path in this case is unreliable because it passes through a great may often loose connections (metal clips that connect each segment of BX sheathing to each electrical box) - connectors that are not designed for nor intended for secure electrical contact to serve as a grounding conductor. Adding individual, properly-wired new grounding conductors, electrodes, etc. to an existing 2-wire circuit? If on the other hand, you are considering providing anew, separate local grounding conductor and local grounding electrode to which you connect a metal electrical box, other than a ground wire that passes all the way back to the main panel, that approach might be technically possible. We need to research the code details further about inconsistent system grounding; an example that comes to mind is the code requirement that a separate branch panel in a detached garage is often connected both to a local grounding electrode at the garage and back to the system ground bus (and through it to the main building grounding electrode) back in the main panel. In general I'm nervous about any home-brew wiring solutions that, even if they seem to "work", may be unreliable, may be confusing to an electrician working on the building in the future, and can certainly add confusion to troubleshooting. Don't rely on a "daisy-chained" ground system such as a grounding conductor wire screwed just to the box, a second ground wire screwed from the receptacle green ground screw then connected to another threaded junction box location, etc. Bond the grounding conductors together and where a metal box is installed, also include a wire that connects the box to the grounding conductor. Code compliance: any alternative local ground installation used to provide a true grounding conductor for a 2-wire circuit would have to be code compliant throughout its design, rout, and components. Current electrical codes permit installing a GFCI protected electrical receptacle on an un-grounded circuit. 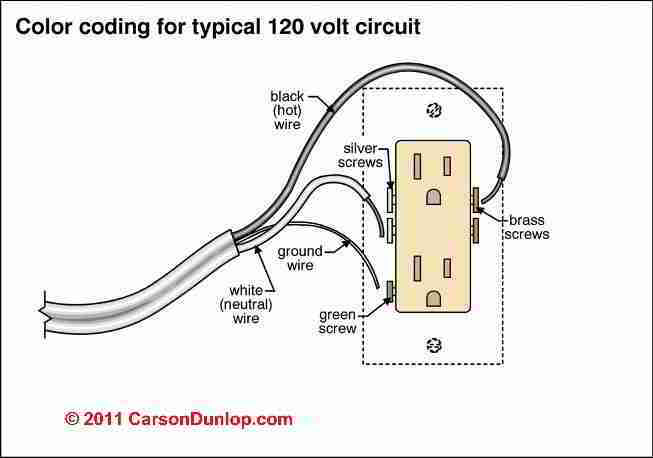 Current electrical codes permit adding a properly sized, routed, connected, protected grounding conductor. Costs of grounding vs re-wiring: It seems to me that the trouble, time, and cost of installing custom, properly-wired new ground pathways connecting to each individual electrical box in an old 2-wire powered circuit would be quite a bit more than if we simply ran a new 3-wire circuit throughout. Please let me know if I've misunderstood your question or the nature of your proposed 2-wire circuit grounding solution. This website provides information about a variety of electrical hazards in buildings, with articles focused on the inspection, detection, and reporting of electrical hazards and on proper electrical repair methods for unsafe electrical conditions. Critique and content suggestions are invited. Credit is given to content editors and contributors. Is it Safe to Use a 3-Prong Adapter to Connect a 3-Pronged Appliance or Equipment Cord to a 2-Prong Ungrounded Electrical Outlet? Continue reading at GROUND WIRE CONNECTIONS or select a topic from closely-related articles below, or see our complete INDEX to RELATED ARTICLES below. 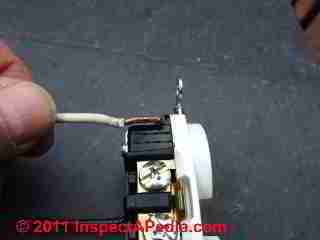 ELECTRICAL CONNECTION for 2-WIRE RECEPTACLE CIRCUIT at InspectApedia.com - online encyclopedia of building & environmental inspection, testing, diagnosis, repair, & problem prevention advice. Special thanks to our reader Steve who pointed out prior errors in our illustrations. Simpson Strong-Tie, "Code Compliant Repair and Protection Guide for the Installation of Utilities in Wood Frame Construction", web search 5/21/12, original source strongtie.com/ftp/fliers/F-REPRPROTECT09.pdf, [copy on file as /Structures/Framing/Simpson_Framing_Protectors.pdf ]. "The information in this guide is a summary of requirements from the 2003, 2006 and 2009 International Residential Code (IRC), International Building Code (IBC), International Plumbing Code (IPC), International Mechanical Code (IMC), 2006 Uniform Plumbing Code (UPC) and the 2005 National Electrical Code." "Electrical System Inspection Basics," Richard C. Wolcott, ASHI 8th Annual Education Conference, Boston 1985. "How to plan and install electric wiring for homes, farms, garages, shops," Montgomery Ward Co., 83-850. "Home Wiring Inspection," Roswell W. Ard, Rodale's New Shelter, July/August, 1985 p. 35-40.